The Saratoga Rugby Club has programs for children, high school and college students. 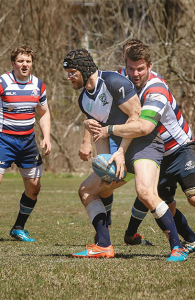 Saratoga Rugby Club is a nonprofit organization dedicated to providing rugby for people within the city. There are currently youth rugby teams for children 6 years old and up, competitive teams for high school and college students, and programs for adults. It was founded in 2005 as a social organization. In a few years, the group has grown into a competitive program that now competes at Division 2 levels. This year, it held the Saratoga Collegiate Cup Sevens tournament. With the growth of the organization, Eric Huss, vice president of the organization, has been interested in seeking out partnerships with community organizations. “We are always looking for strategic partnerships. We want a partnership where we can both benefit from each other,” said Huss. Julie & Co. is the latest company to sign on as a strategic partner with Saratoga Rugby Club. Lars Huss-Skladzinski and Katherine Nemer, both licensed real estate salespeople with Julie & Co, will be collaborating with Saratoga Rugby Club. Saratoga Rugby Club already has some ideas planned for how they will collaborate with Julie & Co. Huss estimated that 100 or more of the members of the club are homeowners in the Saratoga Springs community that are looking to buy or sell a home. Julie & Co. will become the official Realtor, helping members with their brokerage needs and providing representation. There will also be exclusive events for the two businesses, advertising, and cross-promoting of each other’s events, said Huss. The motto for Saratoga Rugby Club is “Leading Saratoga in Sporting Excellence” and Huss said strategic partnerships such as this one are the key to doing that. Rugby is purported to be the fastest growing sport in the United States, with number of participants growing 350 percent from 2004 to 2011. Huss said several children joined rugby this year after seeing the sport featured in the Summer Olympics in Rio de Janeiro. “We have rugby for anybody, up through retirement age,” said Huss.